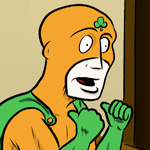 Classification: With his limited superhuman abilities and due to his supernatural origin, Captain Ireland is classed as a Meta-Human and a Mystic. History: Little is known about Captain Ireland’s history. It is known that his powers are granted to him from an outside force, and he is at his most powerful while he is within Ireland’s borders. As such, the Superpower Union keeps him as a regional representative, and he is not on any team.